Thank you to our colleague Wells Ye of Fresh Tech Maid in Chicago Illinois for providing this guest post for us. Here at All Star we also are active members of The Association of Residential Cleaning Services International, and have been awarded the ARCSI Seal of Excellence. Check out Fresh Tech Maid’s Blog for more great articles about how to select the right maid service for your family. Before hiring a house cleaning service, check out if the company has the membership of ARCSI! There are associations and groups for many different industries. When it comes to house cleaning services – or cleaning services nationwide and throughout the world –there is ARCSI. ARCSI stands for Association of Residential Cleaning Services International. Companies must pay a yearly membership fee to join, and can achieve the ARCSI Seal of Excellence if they meet a series of important criteria. ARSCI is a member-based professional trade association. 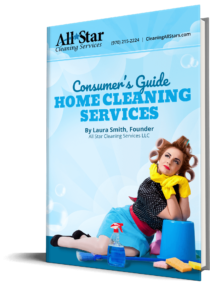 It was established in order to provide business owners in the house cleaning industry with opportunities to come together to share ideas and information, as well as experience. These business also came together in order to promote professional standards in the house cleaning industry. Without it, many people looking for a cleaning service would not know where to turn. This professional association provides them with a starting point. So, you might be wondering, why it is so important to make sure that the house cleaning company that you are thinking of hiring is a member of ARCSI? Easy. Companies that join ARCSI constantly and consistently perform on the professional level. They meet industry standards, and some even exceed those parameters. Holding an ARCSI membership speaks loudly about the professionalism of the company. This is due to that fact that ARCSI promotes professional standards in performance. These include safety on the job, the quality of their employees, and the quality of the services that they offer. Think of it as being kind of like the top 5% of cleaning companies in the world. You want to hire one of them, as they will do the best job, will strive to meet your realistic needs, and will offer great customer services on top of everything else. You will find this company through their membership in ARCSI. A company that joins ARCSI shows that this company intends to learn from the best businesses practices in the industry. Do you want to hire a company that always tries to learn and improve? Of course you do! Any good house cleaning company will be more than pleased to work with you and answer your questions honestly. You may not like the answers (especially when asking about having the same technician every clean, which just is not possible, or whether or not the “perfect clean” is within reach, which is not something that can be attained) but they are honest and that is what matters. These types of residential cleaning services are the ones that are members of ARCSI. When you start looking for a house cleaning company, make sure that you go to ARCSI’s website (www.arcsi.org). They offer a searchable data base of companies. You can look for one in just about any country, or, if you are in the United States, you can narrow the list down by state. This database has companies listed nearby you, as well as reviews and other information on that company. If they have a website, that will be listed as well. You can do your research on the site, and then move to other sites (like Yelp, or Google Plus) for extra resources. Of course, once you find a few companies that look promising, you will need to call them up, ask questions and seek out referrals in order to narrow that short list down to one. Make sure to do your homework, and let the company know that you found them through ARCSI. This shows that you are an educated client, and residential cleaning services like educated clients, as they are more likely to work with the company and understand that cleanings need adjusting before they meet everyone’s expectations. ARCSI also offers a Seal of Excellence program. This is an award that is given to the top performers in the industry. “We believe the Residential Cleaning Seal of Excellence will become the industry standard for professionalism, ethical conduct, and consumer service,” said ARCSI. The Seal of Excellence is not given out to just any company. It must be earned. In order to a company to receive one, they must meet a list of specific criteria. These criteria include being properly licensed and bonded (this includes worker’s compensation insurance where it is required, as well as other forms of insurance protection) and proof that background checks and other tests are done on applicants in order to weed out and hire the best possible employees. Plus, the company has to have been in business for at least two years and the residential cleaning service has to have been present in industry functions, education sessions and conventions. This shows that the company is dedicated to the industry. Once a company is awarded with a Seal of Excellence, their work is not complete. They must sign a document and agree that they will keep up their business practices. This includes being courteous when responding to complaints and general inquiries, constantly striving for improvement in all categories (as even the best company can improve in one area or another), and compliance will all federal, state and local laws and regulations. Ethical business practices must be adhered to, employees must be properly trained and provided with the correct equipment, and the cleaning company must be willing to contribute to industry wide improvement efforts and involved in related activities. This Seal of Excellence is not something that is easy to achieve. There are around three or four companies in each U.S. state that have been awarded it. Fresh Tech Maid is one of three in the entire state of Illinois to be given this honor. When you are looking for a house cleaning company, check the ARCSI website first. A membership in this organization is a strong indicator of the company’s performance, and is a sure sign that you are hiring someone trustworthy and willing to work with you in order to meet your cleaning needs. Sure, there are other companies out there, but why not make your search easier by going straight to those who have been vetted and are the best of the best?